No this is not a cake with slivered almonds, it's a frittata!! Last week, while recovering from restaurant overload, I cooked at home every night. The snow and dreary weather were making me thoroughly depressed. My hubby was in Chicago on business, so I was cooking just for one. And as I really hate to eat alone, I didn't want to spend too much time in the kitchen and all I wanted is quick meals and comfort food. Well, how often do we cook nice fancy meals just for ourselves, with no one to impress? Last night, I made this frittata for a light dinner. Usually, I make a lot of frittatas. I think they're so versatile, they fill your belly and allow you to use up leftovers. The magic touch in this particular frittata was the toasted slivered almonds I sprinkled over the top of it. Toast the slivered almonds in a skillet over medium heat, until lightly browned. Set aside. Wash and slice the zucchini using a mandolin. In a big bowl, beat the eggs, add the zucchini slices, the parmesan and the herbs. Season with salt and pepper. Heat the olive oil in the skillet, and pour the egg mixture. Cook on low heat around 7 mn, then flip the frittata on a plate and cook it for another 2 mn. Garnish with the toasted slivered almonds. You can eat it hot or cold. Faites dorer les amandes à sec dans une poêle. Réservez. Lavez et râpez la courgette à l'aide d'une mandoline. Cassez les œufs dans un grand bol et fouettez-les. Ajoutez les courgettes, le parmesan et les herbes. Poivrez et salez. Faites chauffer l'huile d'olive dans la poêle. Versez la préparation aux œufs et faites cuire à feu doux 7 mn environ, puis retournez délicatement avec une assiette et poursuivez la cuisson 2 mn. Parsemez d'amandes grillés. Servez chaud ou froid. I love frittatas too but for some reason forget to make them - this looks delicious! On peut presque croire que c'est un dessert.... bonne idée les amandes sur le dessus. A gorgeous combination! Great idea. I love the addition of almonds. I've never seen that before or thought of it either--and I make lots of frittatas! Thanks! jamais une frittata n'aura été aussi tentante et gourmande! That's just beautiful...and a Brilliant idea! j'aime bien les frittatas mais je n'en fais pas souvent; la tienne a l'air si bonne et très élegante avec les amandes posées dessus! Truly wonderful fritata, I love the crunch almond on top ! A gorgeous looking frittata! I love the almond topping, so delicious! This is a fantastic-looking frittata! 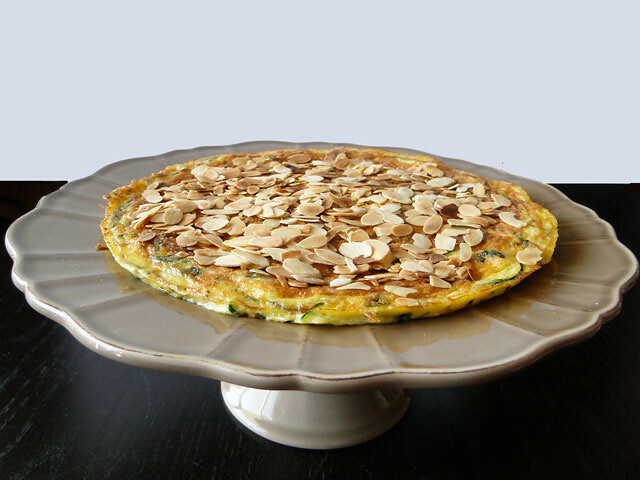 The almonds on the top are adding a delicious crunch to the flavours of the frittata: it is a brilliant idea. 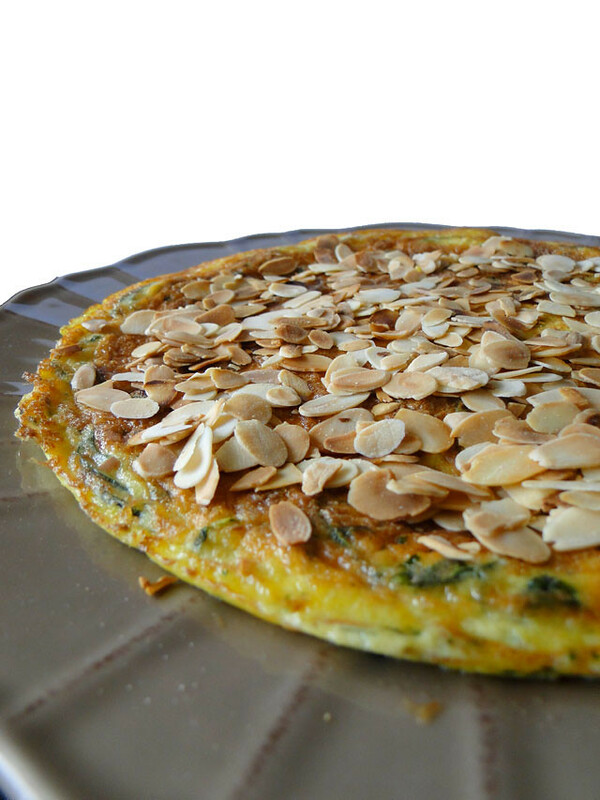 A frittata with almond topping...mmmm..that sounds just irresistible! Un délice cette frittata avec les courgettes et les amandes!! Zucchini and almonds, such a great combination. Great idea for a frittata! 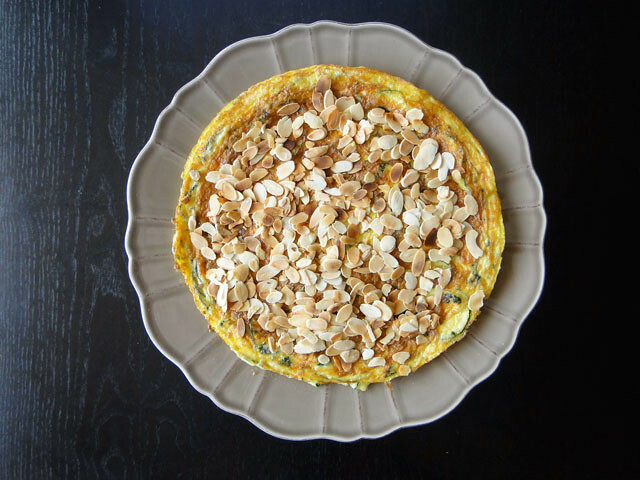 Crunchy almonds sound great on a frittata! It looks gorgeous too. The best part of this frittata is the mint and the almond. WOW.Thanks for the idea of using almonds in a frittata. excellente idée avec les amandes ! bravo ! 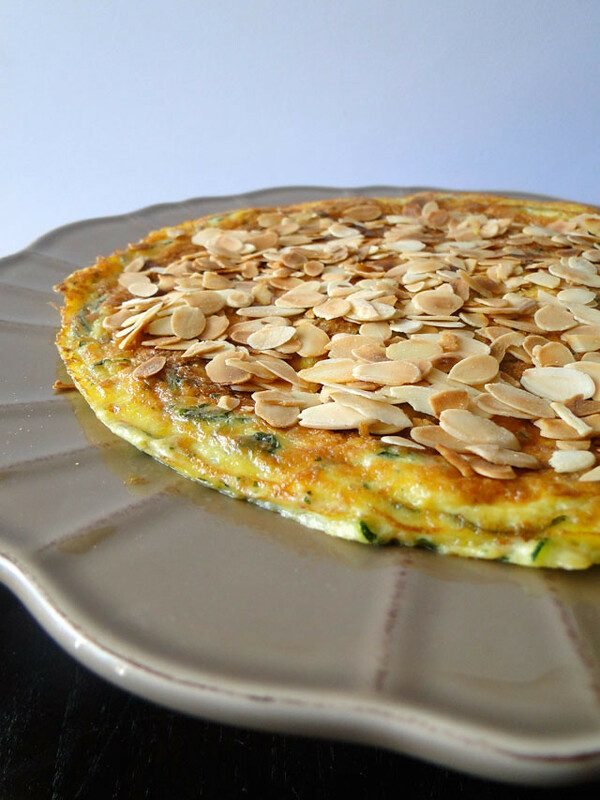 This is an original frittata, topped with almonds. Sounds delicious. A gorgeous frittata! I am just in the middle of baking some mini quiches (much like your frittata) that I will freeze once cooled and re heat for guests this weekend. It's a great timesaver and a flavorful bite! The almons are a very different addition here ... they add a nice crunch!